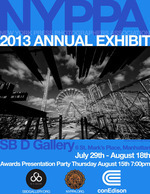 78th Annual EXHIBIT AND AWARDS NIGHT — New York Press Photographers Association, Inc.
Come honor your colleagues and friends at this great event where more than 150 images will be on display at SB D Gallery, 6 St. Marks Place (2nd Floor), East Village, NY on Thursday, August 15, 7 p.m. The winners of Best in Show and Photographer of the Year will be revealed at this year's event. We will also be honoring Jerry Engel who has spent nearly 40 years as our Liaison to the NYPD. His work helped us maintain good relations with the police and helped many of our members smooth the way for proper coverage of news events. He will receive the Louie Liotta Award, named for famed NY Post Photographer Louie Liotta who was best known his award-winning street photography and his fedora that always featured his press card sticking out of the brim. Police officials will be present to help us honor our friend Jerry. The evening will feature a full buffet, open bar, and true fellowship with your colleagues and friends in the air conditioned gallery owned and operated by our good friend Seolbin Park.